Use our mobile marketing primer to get up-to-speed with the opportunities of mobile marketing. 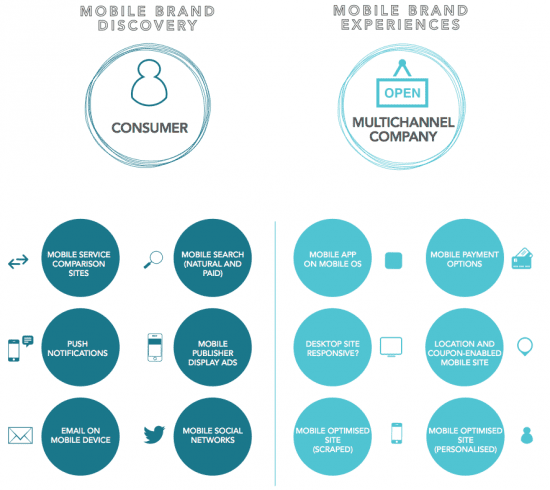 Is your mobile user experience fit for purpose? These are the main customer touchpoints that must be reviewed within a mobile marketing strategy as we explain in our 7 Step Guide to mobile strategy for Expert members. These touchpoints are defined by Rob Thurner and Dave Chaffey, thanks to Design and Online Marketing agency eibDigital for creating the graphic. Mobile marketing covers a range of mobile devices including, of course, smart phones and dumb phones, but also tablet devices like the iPad. Aside from marketing to the mobile web, mobile apps, SMS marketing and proximity marketing are key mobile marketing approaches. Mobile 'Showrooming' - A threat or an opportunity?